M T D J u n e 2 0 1 8 14 N e w s / V i e w s Thomas leads Carlstar Carlstar Group LLC has named Jacob Thomas as chief executive officer and board member, effective May 8, 2018. He succeeds John Salvatore, who has retired. John King is keynote John King, CNN's chief national cor- respondent and anchor of Inside Politics, will share his perspectives on the mid-term elections with attendees at the 2018 Auto- motive Aftermarket Products Expo (AAPEX). GM honors 6 tire makers Six tire manufacturers are among the 125 companies honored by General Motors Co. as a supplier of the year. The tire mak- ers are Bridgestone Corp., Continental Tire the Americas LLC, Goodyear Tire & Rubber Co., Hankook Tire America Corp., Maxxis International and Michelin North America Inc. Auto Pride brand expands The Automotive Distribution Network has extended the Auto Pride brand with the signings of NFADA Warehouse based in Williamsville, N.Y., and Parts Pro Automo- tive Warehouse in Del Rey Beach, Fla. Kumho gains fitment Kumho Tire U.S.A. Inc. has been selected by the Volkswagen Group of America as an original equipment supplier for the new 2018 Atlas SUV. The SUV will be avail- able with the Kumho Crugen KL33 in size 245/60R18 in the North American market Kershaw is vice president After more than four months as associate vice president, Doug Kershaw is officially vice president of BKT USA Inc. His goals include further establishing the BKT brand in the off-the-road, original equipment, agri- culture and construction markets. Ford expands Omnicraft Ford Motor Co. has introduced master cylinders and fuel injectors to its Omnicraft brand of replacement parts for non-Ford/ Lincoln vehicles. Denso adds training Denso Products and Services Americas Inc. has added advanced air conditioning training to its instructor-led automotive repair courses. Bites Mavis adds 6 Dekalb Tire stores T he Mavis Tire Supply Corp. foot- print is getting larger. On the heels of its purchase of five Hill Tire Centers in South Carolina, Mavis has picked up six Dekalb Tire & Automotive Service locations in Georgia. e Dekalb Tire purchase gives Mavis 74 stores in Georgia. 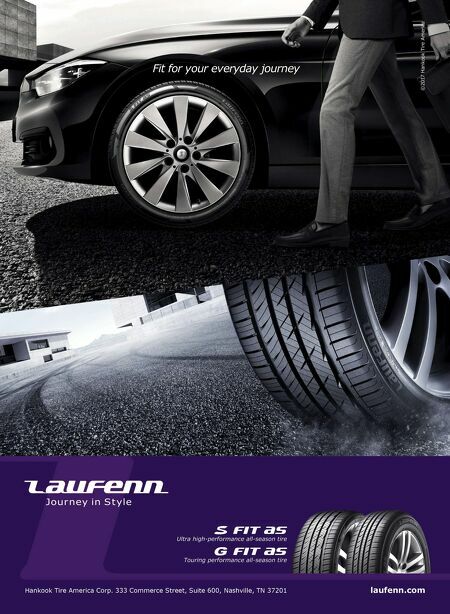 Earlier purchases include Kauffman Tire Inc.'s 69 retail stores in Georgia and Florida. In March, Mavis purchased Sun Tire and Automo- tive Services, an 11-store chain based in Jacksonville, Fla. In February, Mavis announced it would merge with Express Oil Change LLC, which does business as Express Oil Change & Tire Engineers. e company will be led by Mavis' current co-chief executive officers, David and Stephen Sorbaro, and Express Oil Change's chief executive officer, Ricky Brooks, who will be executive chairman. 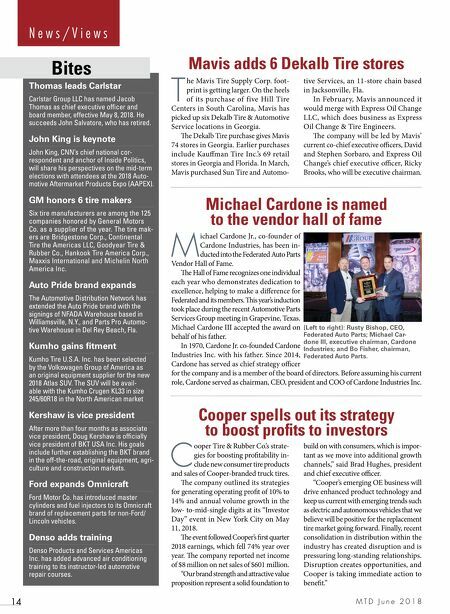 Michael Cardone is named to the vendor hall of fame Cooper spells out its strategy to boost profits to investors M ichael Cardone Jr., co-founder of Cardone Industries, has been in- ducted into the Federated Auto Parts Vendor Hall of Fame. e Hall of Fame recognizes one individual each year who demonstrates dedication to excellence, helping to make a difference for Federated and its members. is year's induction took place during the recent Automotive Parts Services Group meeting in Grapevine, Texas. Michael Cardone III accepted the award on behalf of his father. In 1970, Cardone Jr. co-founded Cardone Industries Inc. with his father. Since 2014, Cardone has served as chief strategy officer for the company and is a member of the board of directors. Before assuming his current role, Cardone served as chairman, CEO, president and COO of Cardone Industries Inc. C ooper Tire & Rubber Co.'s strate- gies for boosting profitability in- clude new consumer tire products and sales of Cooper-branded truck tires. e company outlined its strategies for generating operating profit of 10% to 14% and annual volume growth in the low- to-mid-single digits at its "Investor Day" event in New York City on May 11, 2018. e event followed Cooper's first quarter 2018 earnings, which fell 74% year over year. e company reported net income of $8 million on net sales of $601 million. "Our brand strength and attractive value proposition represent a solid foundation to build on with consumers, which is impor- tant as we move into additional growth channels," said Brad Hughes, president and chief executive officer. "Cooper's emerging OE business will drive enhanced product technology and keep us current with emerging trends such as electric and autonomous vehicles that we believe will be positive for the replacement tire market going forward. Finally, recent consolidation in distribution within the industry has created disruption and is pressuring long-standing relationships. Disruption creates opportunities, and Cooper is taking immediate action to benefit." (Left to right): Rusty Bishop, CEO, Federated Auto Parts; Michael Car- done III, executive chairman, Cardone Industries; and Bo Fisher, chairman, Federated Auto Parts.